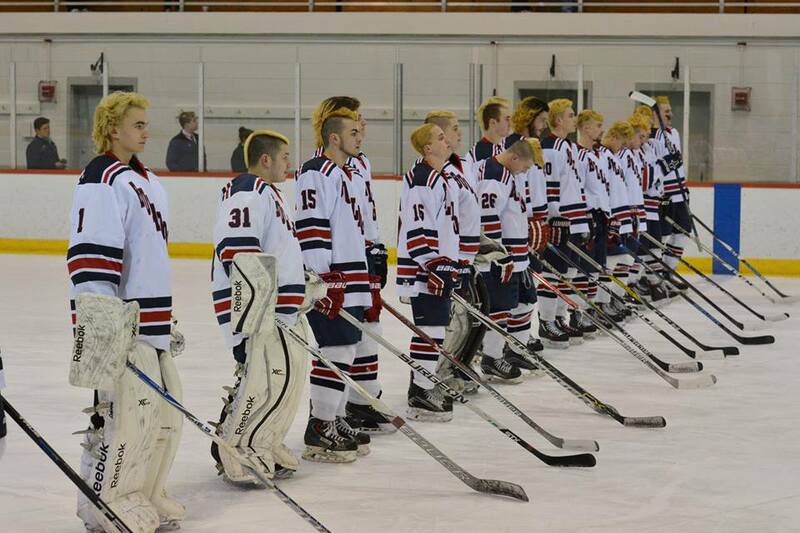 The RHS hockey team made waves this winter, finishing the regular season with a 18-1-3 record. For a team that is usually criticized for having a great regular season only to lose early in tournament, the Dogs went on a post-season run that won’t soon be forgotten. In the first round, Rockland took on Cardinal Spellman at Gallo Ice Arena in Bourne. The Rockland crowd came straight from the boys’ basketball game, played earlier just down the road at Bourne High School. The hockey team avenged the basketball team’s defeat, and were victorious in a 5-1 effort. Goals were scored by senior defenseman Brian McCullough, junior forward Matt O’Brien, freshman forward Zach Callahan, junior forward Mike Flaherty, and junior forward Joe Campanile. It was a dominating victory, and was a confidence booster for the Dogs going into a huge matchup with Hanover in the quarterfinals. Rockland’s matchup with Hanover was simply one for the ages. Defense was the name of the game, and junior goaltender Harry O’Brien (40 saves) shined against an experienced Hanover offense. After two overtime periods the teams were still knotted up at zero. Heading into a shootout, Coach Mike Flaherty looked to his seniors for some needed leadership. Hanover’s Zach Taylor scored in the shootout, but it was Zach Callahan who put the dangie on the Indian-goaltender to capitalize on the equalizer for the Dogs. Bulldog Nation roared in unison as their boys had brought it back to a tie game. Dunn skated to his right, made a move, and as soon as the goaltender bit, he wristed in a backhand on the left side to take the lead. As Dunn celebrated in front of the Hanover crowd, the Rockland fans jumped for joy. Harry O’Brien made his final save of the game, and it was over. The Dogs defeated Hanover for only the second time in the program’s history for a trip to the D3 South Semifinal. In what will go down as one of the scrappiest, hard-fought games in the team’s history, Rockland defeated the Nantucket Whalers by a score of 4-2. The Whalers scored first, but the Dogs came back on a hard slap-shot by McCullough. Callahan was able to find the back of the net once again, as did Mike Flaherty and Matt Dunn. Senior defenseman Chris McHugh had 3 assists on the night. O’Brien shined once again, making great save after great save to jumpstart the Bulldogs defensive efforts. Rockland ended Nantucket’s perfect season, and set up a matchup with Old Rochester in the D3 South Final. Rockland was ultimately defeated by Old Rochester in the South Final 2-1. Senior Brian McCullough scored Rockland’s lone goal, but the speed of Old Rochester took a toll on the resilient Dogs. They fought hard, but could not overcome the enemy Bulldogs. This winter season was made one to remember, thanks in part to the hockey team. This hard-working group of Bulldogs woke up early every day to put it all out on the line for their fans. Those who followed the team closely this year know exactly how much fun they were to watch. The mix of passion, determination, and skill, paired with the wise coaching of Flaherty made for a truly special season.